Microsoft is most commonly associated with developing Windows although few people know that Redmond has also been working on another operating in secrecy for several years. It’s been more than four years since we last heard about project Midori but we have now learned that it’s still very much alive and moving forward, according to ZDNet’s well-sourced Mary Jo Foley. 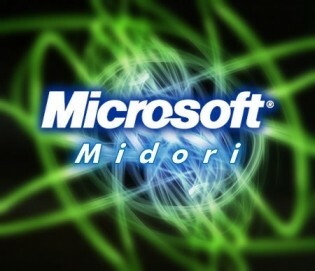 For those unfamiliar, Midori is a new operating system believed to be designed around Singularity, which was a Microsoft Research microkernel operating system. The under-development OS was (and maybe still is) overseen by senior vice president of technical strategy Eric Rudder. At its heart, it is believed that Midori is a distributed, concurrent OS. The operating system was referenced during a presentation last month at the OOPSLA 2012 conference. A number of Microsoft employees presented a paper during the event titled Uniqueness and Reference Immutability for Safe Parallelism. In it, Microsoft outlined what is described as a prototype extension to C# that facilitates security and parallelism. "A source-level variant of this system, as an extension to C#, is in use by a large project at Microsoft, as their primary programming language." Additionally, a recent Microsoft job description called for a software architect to help develop a concurrent programming model. That excerpt has been reproduced below. "This programming model is a core component of a new, novel operating system, 99% of which is written in type- and memory-safe C#. A core principle we add to managed code is that 1st class, statically enforced concurrency-safety must become a peer of type- and memory-safety. This role demands innovation at each layer of the software stack: programming model abstractions, scheduling (kernel and user-mode/runtime), message passing and asynchrony more generally, shared-memory, data and task parallelism, distributed parallelism, heterogeneity (including vectorization and GPGPU), interaction with processor architecture, feedback directed optimizations, and even language design and compiler implementation." Foley says she discovered the OOPSLA 2012 paper through blog posts from Rob Jellinghaus and Joe Duffy, two people thought to be working on Midori. The person that tipped her off to the blog posts, however, wished to remain anonymous. She concludes that not all internal Microsoft projects make it to production. But when you consider just how long Microsoft has been working on Midori, odds are that it will eventually see the light of day at some point in the future.